In Hanoi, the capital of Vietnam, stands the tallest building all over Vietnam, the skyscraper Keangnam officially named Keangnam Hanoi Landmark Tower. With its 336 meters and 70 stories height, this giant made of steel and glass, which is still under construction, will be the headquarters of the South-Korean company Keangnam Vina, and also hotel, shopping mall, convention center and apartments. 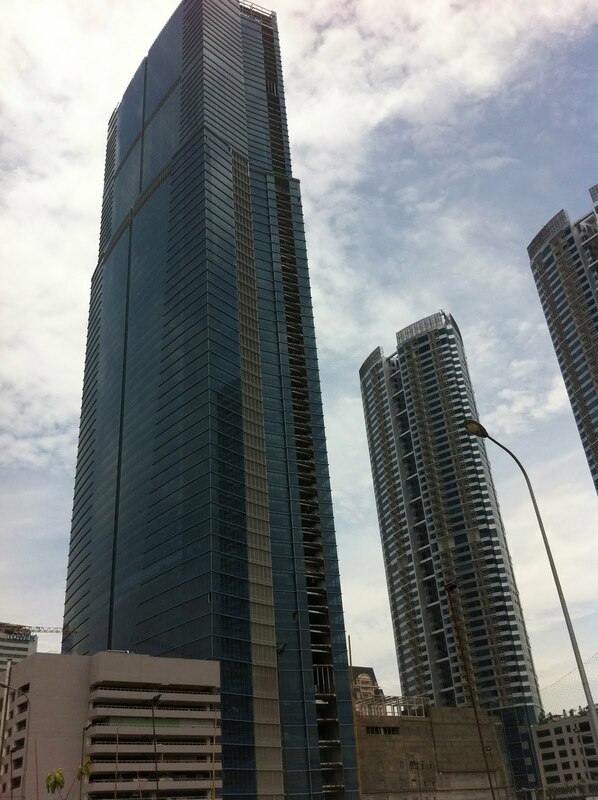 Although the skyscraper still under construction, its 336 meters height (345m if we include the antenna) has displaced Bitexco Financial Tower in Ho Chi Minh City, as the tallest building in Vietnam. Keangnam Tower is ranking 26 of the world's tallest buildings and ranking 17 of highest offices for rent all over the world. El rascacielos Keangnam de Hanoi alberga en su interior 70 plantas (4 pisos subterráneos) y en lo más alto, un helipuerto. Esta torre ocupa una superficie de más de 579.000 m2. La inversión total supera el billón de dólares. Este edificio será la futura sede en Vietnam de la compañia Keangnam Vin de Corea del Sur. Hanoi's skyscraper Keangnam houses inside 70 floors (4 underground levels) and on the top, a heliport. This tower occupies an area of ​​579,000 m2. The total investment exceeds a billion dollars. This building will be the future headquarters in Vietnam of the South Korean company Vin Keangnam. The complex consists of 3 towers, where the main tower, Keangnam Tower (336 meters), is guarded by another 2 towers (212 meters), 47 stories high each, which will be private apartments mainly. The lower levels and also on the surface, will be the parking lot (cars and motorcycles). The project should be completed in 2011, but it's quite difficult they can meet this deadline. The tower holds the height record but it has also broken the record of industrial accidents and incidents. In July 2009, four workers died after falling from a considerable height, in February 2011 other two people lost their lives for the same reason. A fire destroyed the 2nd floor on May 2, during March 2010 and October of that same year, some debris fell to the ground, injuring a passerby who was walking through the area. The skyscraper is located on the outskirts of the city, southwest of Hanoi, at the intersection of Phạm Hùng and Đường Mễ Trì (see Hanoi City Map or directly into google maps). It takes approximately 20 minutes by car from Hoan Kiem Lake. The construction zone where the tallest skyscraper all over Vietnam stands, the Keangnam building (Keangnam Hanoi Landmark Tower). The construction works haven't finished yet. The district where the tower Keangnam Hanoi is being built (on the outskirts of Hanoi). There is a Vietnamese government building that resembles to Terminal 4 of Madrid Barajas Airport. A couple of videos at the foot of the Tower Keangnam of Hanoi. As you can see, the complex will consist of several towers. The main building (and higher) is Hanoi's skyscraper (Keangnam Hanoi Landmark Tower). In the pictures you can see the entire complex, still under construction, where the tower Keangnam stands (Keangnam Hanoi Landmark Tower). In the pictures you can see the surrounding towers, 212 meters high, which however doesn't seem as tall because of the 345 meters of Vietnam highest building, that outshines them. This picture clearly shows the chosen area for the construction of Hanoi's Skyline and expansion area of ​​the city. Currently is just a bleak landscape. In the adjacent streets to Keangnam Tower, huge towers hives were built to accommodate the growing population of Hanoi. Although these buildings were recently built, they are in bad condition due to the low quality materials used. David vs Goliat: a small house has found some room between the colossus. As we go away from Keangnam Tower, we re-enter the busy city of Hanoi, with their bikes and chaotic traffic. Matter of perspective: to be the tallest building in Vietnam, as we just move away a hundred meters, the great Keangnam Hanoi Landmark Tower doesn't impress at all. La cosa cambia cuando nos encontramos a los pies del rascacielos, con razón es el punto más alto del país. Huge, modern, eastern shopping Mall called Grand Plaza. Grand Plaza Shopping Mall (Hanoi, Vietnam) on the way to Hanoi's Skyscraper. Vietnam govertment has earmarked this area of Hanoi to hold towers and skyscrapers of any corporation willing to establish their headquarters in Hanoi. There is still much to be done, but one day, hopefully soon, the urban landscape of this ancient city will be very different from today.